How can one create a future, in the present, without the constraints of histories? Better yet, how can we imagine a future that it isnotdefinedbythetermsofadominantnarrativenoworinthepast? Taking its title from a song on Frank Ocean’s 2016 Blonde album, Futura Free: a sensing, is the second exhibition in our PossibleFutures Programme which reappraises the work of the gallery since 1988 to consider how we might move forward. Curated by agency for agency, the exhibition features work by four emerging artists Thandi Loewenson, Christopher Lutterodt-Quarcoo, Jade Montserrat andEmily Mulenga. Ocean’s lyrics present an allegory of defiance. A personal ode to a self defined possible future. The work in this exhibition reflects a similar desire by the artists to resist the given order of things with actions and propositions to define their selves and theirworlds. photographs are inspired by Josephine Baker’s adopted family and lifestyle as a way to rethink ‘utopia’ as created in learning, nature and culture from a historical fictional perspective. ChristopherLutterodt-Quarcoo’s Griot/r is an audio film installation, that introduces the role of the griot in a technological future to unearth lost and disregarded accounts in history objects and spaces, questioning the practice of audio extraction to raise resistance in the debate between “fact” and “truth”. Thandi Loewenson’s Minescape Scene 2: The Fields of Indestructable Leftovers, brings her research from one city space of urban speculation, Lusaka, Zambia to Brixton, London, Loewenson, will create an evolving drawing that explores the ‘the city’ as a site of wastes, which paradoxically, through resourceful waste management hints at a possible future which may emerge, and in doing so reject, the harmful cycles of extraction. Although the title of this exhibition is inspired by the Ocean song, it must also be mentioned that Futura is a popular font, designed in the 1920’s by Paul Renner. The intent behind its design was to reflect the creation of new models not revive historical ones, as such making a proposition for designs that project forwardthinking. This exhibition begins to explore possible futures as they are imagined by the four artists in relation to the past and the present. The subtle sensing of each artists project is an attempt at a kind of making sense of things, which is tied to their historical, social and political positions in the world. A world where their presence in the present is determined by colonial legacies, migrations, distant connections, spatial negotiations, expressions of belonging and the defining of place. Bringing with them the knowledges contained in their bodies personal, social and historic experiences Lowenson, Lutterodt-Quarcoo, Montserrat and Mulenga, are working through imagined futures using the tools of the present to reflect or contrast supposed grander narratives. As part of the Futura Free: a sensing exhibition artists Jade Montserrat and Emily Mulenga will speak with artist Jamila Johnson Small about their practice. Mulenga’s installation explores contemporary digital living and utopic spaces of online existence. MulengaMoji: Healing Crisis features an avatar of Mulenga in various familiar scenarios some fantastical and others of everyday life. The avatar of Mulenga dances, entertains, relaxes she is a female existing in a variety of landscapes and spaces that have the potential to be part of real life. Jade Monteserrat’s installation features work from her on-going research and art making titled The Rainbow Tribe. The Rainbow Tribe is inspired by Josephine Baker’s own ‘rainbow tribe’ of children, which she displayed as a utopic living family. Montserrat at the centre of her work is the female protagonist acting and doing in order to challenge the standing order of things and to explore places of healing for a future existence. 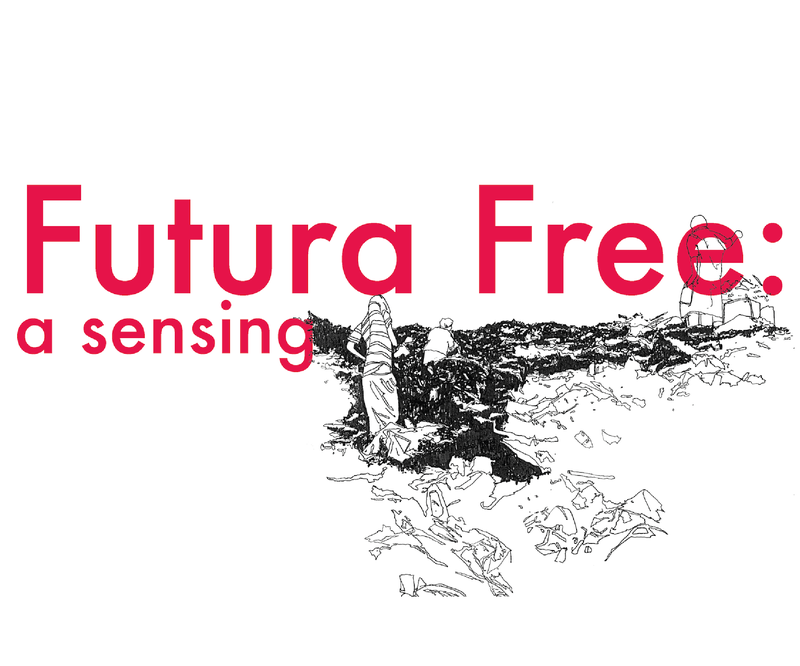 As part of Futura Free: a sensing, exhibition artists Thandi Loewenson and Christopher Lutterodt Quarcoo will speak with musician and architect Gianmaria Givanni about their work and the pieces they are showing in the exhibition. Both Lowenson and Lutterodt- Quarcoo’s pieces in the exhibition consider the possibility of the archive as what’s there, in the form of the waste dumped or left in the streets of Lusaka or language as in oral tradition of the Griot. Both make propositions for what might be retrieved, proposed and what might happen in the future, to the city or to the unmaterialised histories. Although pieces are being shown in a gallery setting both Lowenson and Lutterodt- Quarcoo’s work begin from the premise of design solutions as they both come from design backgrounds, Lowenson’s being architecture and Lutterodt- Quarcoo interactive design. This talk will not only explore the the parallel themes in their work but also the way that their creative approach to design solutions intersects with other creative practices to broaden the scope of the kinds of conversations they can have with clients, commissioners and the public. ‘Archive of Unmaterialised History’, has made it their objective to unearth the omissions, voids and inaccuracies in the narratives that currently define our society. Within the decommissioning statment of the Griot/r, a warning was issued, threatening to disrupt the ideals that bind our community together, through each ‘Case of Plausible Doubt’. As a respected leader in your sector, the potential of irrevocable damage draws near, it is your responsibility to act pre-emptively and issue a statement to neutralise the threat of the Archive of Unmaterialised History and what is about to be disclosed. We associate the ruptured and barren landscape of the pit site with extraction, stripped bare and rendered without conceivable prospects of a future. What if the city is just as damaged? This scene is one of a series which explores and gives fictional form to the ‘minescape’, a topography of sites connected by mining. It draws on site visits and interviews in Lusaka, Zambia, exploring the entanglements of the city and the pit and the potential for alternative futures toemerge. Thandi Lowenson (b. Harare, Zimbabwe) received her MArch in Architecture with distinction and the Bannister Fletcher Medal from The Bartlett School of Architecture, UCL, in 2013. She works part time in an architectural studio in London and writes and draws as a freelance venture futurist and space maker for hire. Her work deals largely with imagining alternative futures and exploring new means and sites of critical spatial practice. Do get in touch to share ideas or for more information or if you’d like prints of photographs or drawings. In a technological future the role of a Griot/r (guardian of a community’s history) has become an autonomous organisation. We stand witness to the decommissioning statement preluding the disclosure of the Archive of Unmaterialised History. allowing for the presence of reverence and the ineffable. He is a graduate of the MA in Design Interactions from the Royal College of Art and a BA Hons in Design for Interaction & Moving Image from the London College of Communication. Recent selected exhibitions include UNION OF AFRICAN STATES, ShowRCA (2016), Witness, Changing Minds Festival (20116), Palimpsest BRI Southbank (2015), Art Licks (Art Lacuna) 2015, Barbican Weekender (2014). The Rainbow Tribe shuns spectacle as a vehicle for visibility or voice, favouring the transparent reciprocity of affectionate movement. The Rainbow Tribe is a supportive collective, transforming cultural currency into empowerment. Exploring self-care and the process of healing as a queer femme of colour. How can we utilise digital space to put ourselves first? Emily Mulenga (b. Staffordshire, UK) uses her own image as a tool to explore ideas around constructions of personae and representations that transcend the virtual and actual. This has previously taken the form of both the use of a virtual avatar in her work, and the portrayal of familiar characters and imagery to the point of parody. The artist is looking at ideas based around the (female, of colour) body in the digital age, with a view to utilising the supposedly democratic nature of online space as a platform for the gendered body of colour. Mulenga studied at the Birmingham Institute of Art & Design. Recent selected screenings and exhibitions include Ambition at HOME (2016), CC Gallery, Malmö (2015), This Is What A Feminist Looks Like, Stryx, Birmingham (2015), DeepTrashItalia:Eurosex,London(2014),FierceFestivalBOM(2014).